The American Cancer Society is celebrating the 31st anniversary of the Great American Smokeout . Alison Prange with the anti-smoking group says since the governor signed a law jacking up the cigarette tax by a buck a pack, smokers are getting serious about wanting to kick the habit. "I think with the increase in the state cigarette tax coming January 1 st we&apos;ve already seen an increase of people calling the Quit Line here in Wisconsin with people wanting to quit." 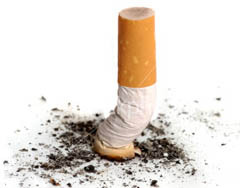 Prange says the idea of the Great American Smokeout is that if a smoker can quit for just one day, maybe it will lead them on the road to a lifetime of not smoking. "It&apos;s just been one of the leading causes of preventable death in this country and we are doing everything we can as part of our organization mission to reduce the burden of cancer and it&apos;s one of the best things that people can do to help do that … for themselves, for their family, for their loved ones." Considering the variety of cessation resources available, Prange says now is a good time to quit. Also, from their website you can download new desktop helpers, including a Quit Clock and a Craving Stopper. This year, almost 4,000 people in Wisconsin will be diagnosed with lung cancer and almost 3,000 of them will die. Prange says 99,000 candles will be lit at the state capitol tonight, representing lives that will be saved because of the $1.00 a pack cigarette tax increase. That includes the 33,000 smokers who will quit smoking and 66,000 kids who will never light up in the first place.